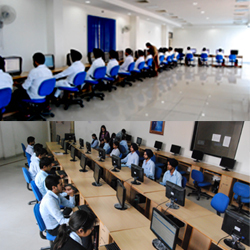 Keeping in view the increased emphasis on technology all departments of SGOC has fully developed computer labs. The labs are equipped with latest software like SPSS, Oracle, Visual Basic, business software etc. 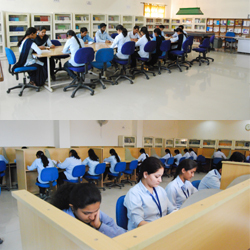 The Labs are spacious and have enough computers to accommodate all the students at same time. Round the clock internet facility is available through Wi-Fi which helps them in academic study and research work. Focusing on the need and importance of Internet in the field of education, SGOC is a fully WIFI campus. The high speed internet facility allows students to access uninterrupted Internet connectivity anywhere within the campus. The coverage of Wi-Fi is not only restricted to class rooms but also extends to all the areas including library, Auditorium and hostels. All the websites browsed by students are regularly monitored. SGOC houses separate libraries for all the departments. The libraries have a rich collection of printed as well as electronic resources which includes books, journals, databases, audiovisual material, CDs, e-journals, annual reports of top corporate, case studies, conference proceedings, training manuals, etc. They are well equipped 24x7 internet facilities to help students in their studies and research work. The Institute provides Hostel facility, separately for both boys and girls .The hostels are well furnished with A.C. and non A.C. rooms for students. For Girl students studio concept rooms are also available with attached pantry and washrooms. There is provision of 24 hours power and water back up with wireless internet connectivity providing a professional ambience for work. All the floors are fully equipped with essential amenities like water coolers, internet access points and telephone facilities. There is a centrally located dining hall, which has easy access from all blocks. The food prepared is of all tastes. The hostel mess is managed by the students body, with the help of an advisory body of the institute. Besides these facilities, there is a T.V. lounge, a gymnasium, a recreation room and facilities for indoor and outdoor games. 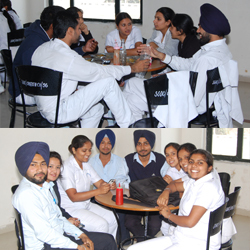 College has spacious canteen facility in the campus itself. A variety of food and snack items are provided to the students and staff of the college at highly affordable rates with highest quality. Adequate seating facilities are provided to accommodate students and staff even during peak time. It is well maintained with efficient service and a take away counter. SGOC has a well organized facility of transport catering to the areas of Chandigarh, Mohali, Panchkula, Zirakpur, Derabassi, Ambala, Patiala and Rajpura. 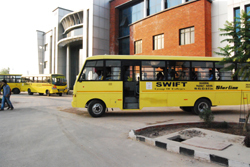 Students desirous of availing transport facilities are required to fill in application form and deposit transport fee. The necessary documents are to be submitted to the transport in-charge along with 2 passport size photographs. Students shall get the bus pass which shall carry details of bus route and its timings etc. Students are expected to strictly follow all the rules and regulations related to availing college.